Any info about the Cygnus total weight, ant Antares total weight for this mission? 3,447 kg (7,600 lbs) of cargo, supplies, and equipment. Heaviest Cygnus on an Antares to date. Scale model and 3-D modeler. Teams are working through final GSE power up. Delayed on that by 10-15mins due to earlier need to shut some systems down for tests and checkouts. Teams are continuing to work through other procedures ahead of the start of fueling. Right now, all remains on track for a 16:46:07 EDT (20:46:07 UTC) liftoff. Here we got the final conformation from NanoRacks. L-4hrs: Teams have received a "go" to proceed with external power on to Antares. GO for propellant sequencer start! Oh... they're discussing a need to go back to the pad for a 5-10 minute operation. Talking about a 15-minute worse case impact to the count. Issue with TEL will require Red Team to go back to the pad and perform ~15mins op. Launch team is still progressing with no discussed impact to launch at this time. RF open loop and transmitter checks being done now instead of waiting as Red Team reviews procedures they'll go once they get to the pad. Red Team cleared for reentry to pad and perform opt to fix TEL issue. My guesstimate is 3,447 + ~2,900 kg = ~6,347 kg for Cygnus with cargo at liftoff. Perhaps this is the first Antares 230+? If not, payload looks to be near the max originally listed for Antares 230. Red Team has COMPLETED their task and cleared the pad. "We are good to proceed at this time." Helium initiation in 30-ish minutes. All systems GREEN at this time! Good question. Forgot to ask about that in interview yesterday. Will send NGIS a note to ask if this is a 230 or a 230+. FTS arm command test in work. 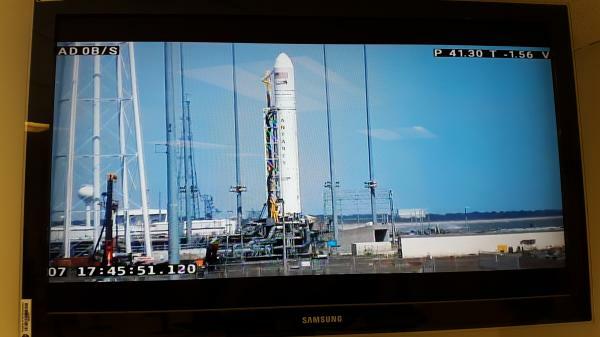 Antares teams continuing to work through vehicle checkouts.